In 1753 Linnaeus placed the two plants shown on this page in the genus Convallaria, Rene Desfontaines renamed the genus Smilacina in 1807, and Johann Heinrich Link renamed it Maianthemum in 1821. 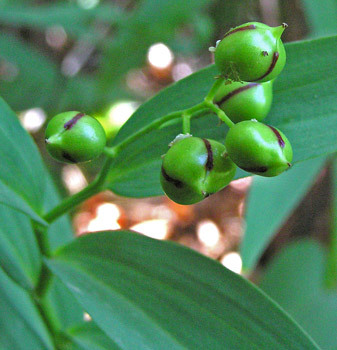 Although Smilacina was the accepted genus name for much of the 20th century, Maianthemum is now widely accepted. Click to see Prosartes and Streptopus. Navajo Lake Trail, September 24, 2012. 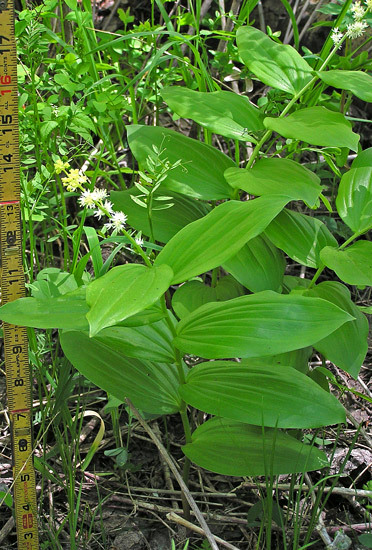 Both Maianthemum racemosum and Maianthemum stellatum are rhizomatous, i.e., they have lateral underground roots from which they sprout new plants. 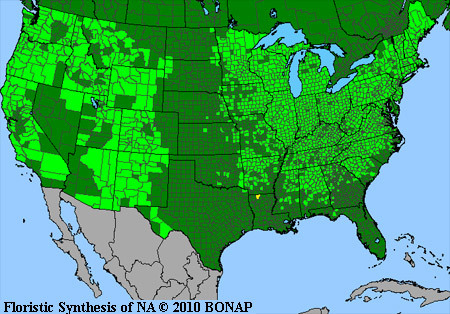 They thus form colonies of plants. Maianthemum racemosum subspecies amplexicaule. 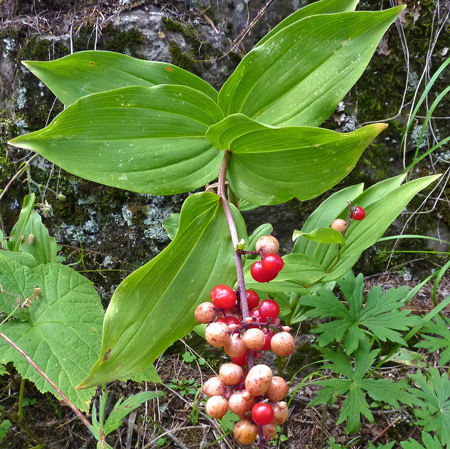 Synonyms: Maianthemum amplexicaule, Smilacina racemosa. 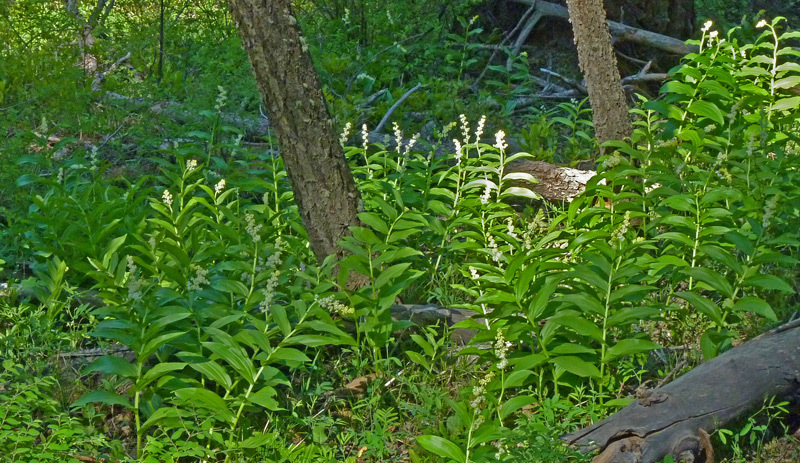 (Solomon’s Plume, False Solomon's Seal). 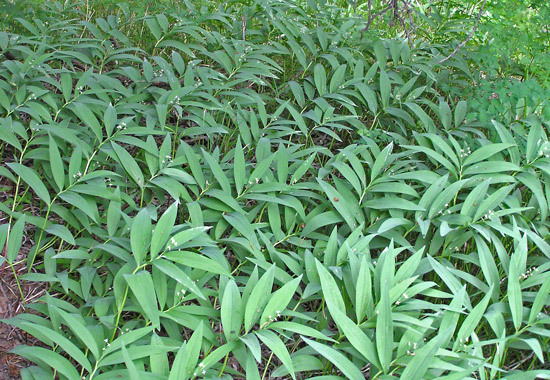 Maianthemum racemosum, sometimes confused with Maianthemum stellatum (see below) and Streptopus fassettii, can be distinguished by its broader leaves and tassel-like flower cluster. Although it is rhizomatous, sprouting new plants from lateral underground roots, it tends to grow in fewer numbers than M. stellatum. Maianthemum racemosum is a common plant in mid-altitude woods, thriving in moist locations where it often grow quite robust and several feet tall. 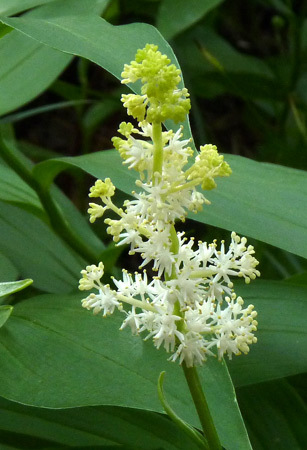 "Maianthemum" means "May Flower", "racemosum" describes the inflorescence arrangement, and "amplexicaule" describes the "clasping" of the stem by the leaves. Lower Calico National Recreation Trail, June 17, 2014. West Mancos Trail, June 17, 2010. 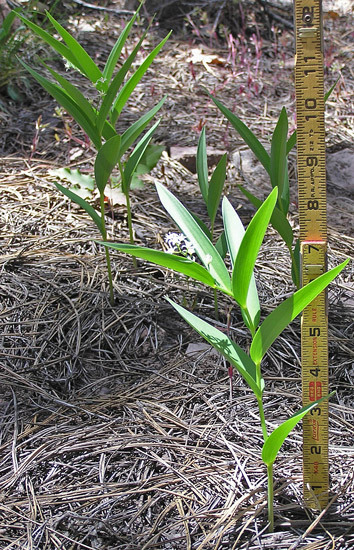 Star Lily is common in the rich moist soils of Aspen woods where it commonly grows in large patches of dozens of plants. 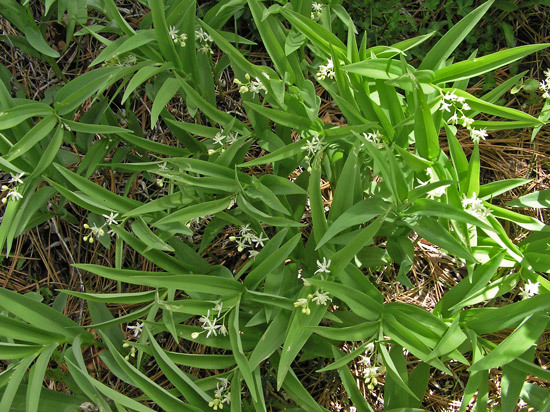 It is especially noticeable on the uphill side of trails arching its tiny star-like flowers downhill toward hikers. 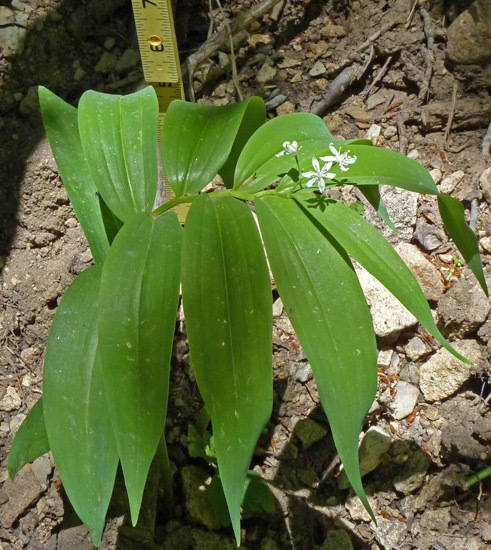 Linnaeus named this species Convallaria stellata in 1753, Desfontaines renamed it Smilacina stellata in 1807, and Link named it Maianthemum stellatum in 1821. "Stellatum" is Latin for "star". 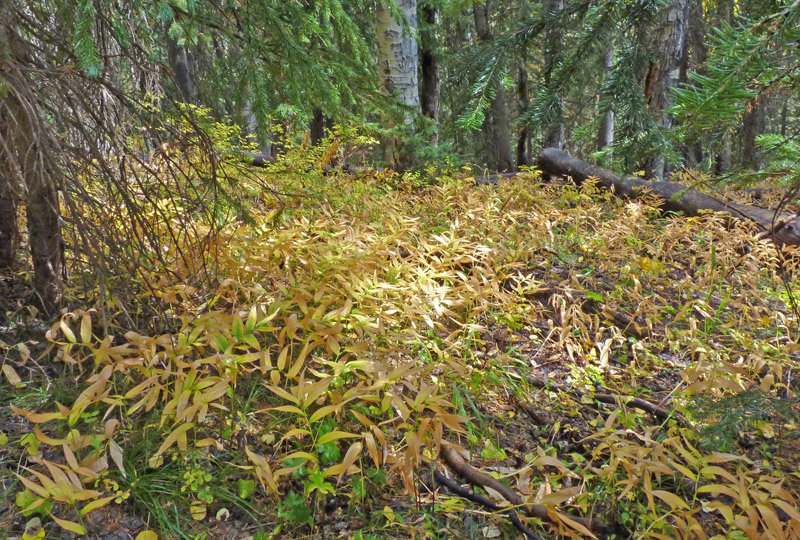 In dark woods, plants can be few and scattered. East Fork of the Dolores Trail, June 30, 2006. 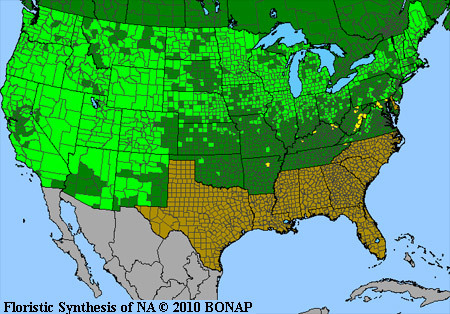 North of Durango, May 29, 2007. In more open woods, plants abound. 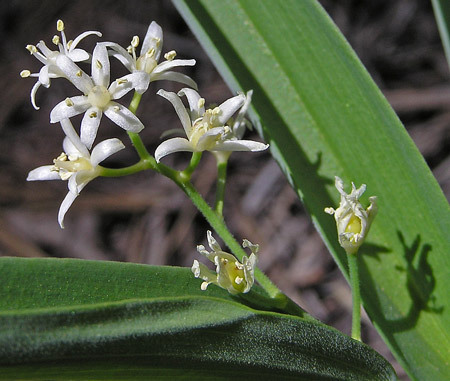 Flowers are tiny and hard to see unless you are on your hands and knees, but the dozens of arching plants with pointed leaves are easily noticed -- and quite common. Fresh flowers grow at the tip and ripening fruit (now yellow, but soon to be red), grows in the fading petals at the base of the inflorescence. Prater Ridge Trail, June 17, 2006.